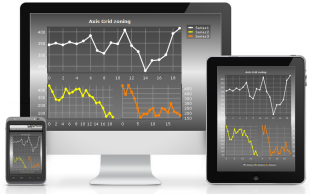 Need to deliver your charting application to a wide field of platforms and devices? TeeChart fits well to differing device formats. See the full article for more information on TeeChart platform support. TeeChart for .NET Chart for Phone 7 Release! TeeChart for .NET Chart for Phone 7 is now available as part of the TeeChart for .NET subscription. The new assembly includes many optimisations for Microsoft's Windows Phone 7 platform. See the Chart Gallery for examples of Phone 7 rendered Charts developed with the .Net component.